all students and teachers who wanted a genuine Roman coin received one to take home and treasure for all time. courtesy of enthusiastic ACE teacher, and ancient coin lover, Kate Gilbert,of Ben Franklin Academy in Atlanta, all students and teachers who wanted a genuine Roman coin received one to take home and treasure for all time. 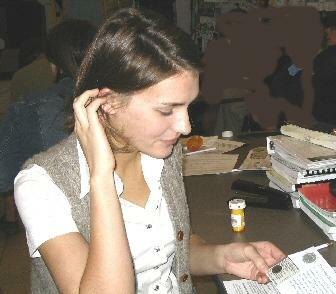 After four years of the school's participation in the ACE program, many students at the Ben Franklin Academy Junior House in Atlanta, who had not taken part in teacher Kate Gilbert's Latin classes and who had wondered about those little bits of ancient bronze some students had studied so intently, were the lucky recipients of a largesse worthy of a Roman Empress! Kate Gilbert had bought extra Roman coins so that all who wanted a genuine Roman coin received one to take home and treasure for all time. She went through " her Imperial hoard" carefully ahead of time to make sure that each coin had at least one element that students could identify without doing any preparatory work. In most cases it was possible to identify the headgear on the obverse, and sometimes part of the inscription. On the reverse there was an identifiable image, which often led us to the inscription. The school in Atlanta, GA, has two populations of students 10th through 12 grades, who attend in either the morning or the afternoon. Each session has a daily assembly, where we make announcements and either discuss current events or present a speaker. Kate Gilbert did the coin presentation at both the morning and the afternoon session. Each coin was wrapped in tissue and enclosed in a used prescription pill bottle. She made little stickers for each bottle, one with the ACE logo and web address and the other, complete with photo of the Flavian Amphitheater, saying "Genuine Roman Coin! Handle with Care!" Kate brought her collection of Roman style headgear: the homemade diadem and radiate crown and the store-bought laurel wreath and helmet. Once the coins were distributed, she asked the students to identify the obverse side and type of headgear. Because Kate had checked out the coins ahead of time, she was also able to describe several of the reverse types that the students were most likely to see. Kate also enacted the part of the Roman soldier in the Fel Temp Falling Horseman type; given just a little more time she would have called for a volunteer to play the part of the barbarian as well! At the beginning of the meeting, all the students wrote their names on slips of paper and deposited them in the Roman helmet. At the end, Kate drew a name and the lucky winner (one in the morning and one in the afternoon) got an identified coin, donated by ACE. Two students, in particular, spent their free break time poring over the ACE resources with Kate in order to get a really solid identification. One of them turned out to have a Constantius Chlorus coin and the other a very late coin, probably Theodosius. Not surprisingly, quite a few of the teachers wanted coins too -- and Kate's supply just stretched far enough to accommodate them ! ..... and she was able to scan and identify each of those. All of the social-science teachers requested coins (definitely a good sign! ), as well as the art teacher who has been working with Kate from the outset, and a number of other teachers too.... and Kate had pre-scanned and identified coins for the teachers, who she was sure would be using them in their classes in various ways. Further teachers specifically requested coins for their children -- yet another way to spread the word - and the fascination of ancient coins!